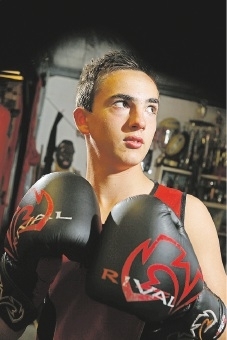 HIGH Wycombe junior boxing champion Ben Innes is not one to give up. The 14-year-old was at rock bottom when he started boxing at Anvil Allan’s Boxing Club about three years ago. His father had just died and as a 46kg 11-year-old, he was struggling with his weight and confidence. But just one year down the track from his lowest point, Ben had redefined himself into a disciplined athlete and quickly shed 14kg to compete in the 32kg weight class. “When I started, I dropped quite a bit of the weight, probably around 8kg, and sat around there for a while and fought at 36kg,” he said. He won his first State title fight and has not looked back since. Last year, he earned a fight in the Australian Boxing Championships hosted in Perth and lost in the semi-finals; but that just pushed him to train harder for fights on the national stage. The determination has now paid off, with Innes returning from the 2015 Australian Boxing Championships on the Gold Coast last month with a national title to his name. He boxed in the under-15 48kg class and beat Queensland boxer Jayde Rowley. Innes described his method simply. “For the Australian title fight I just went straight for it on the attack and moving around,” he said. His coach Jeremy Allan, a former Australian champion himself, said Innes was a natural and had improved tremendously. Allan also trained his own son Brandon to the Australian Championships and he went on to win a gold medal at the Commonwealth Games. “He came to me during a pretty tough time and was a pretty chubby kid,” he said. “Then he lost a heap of weight to have his first fight at 32kg, which is a great effort for a young boy; he got right into it. Innes said he planned to have a break from intensive training for a few months before he started preparing for his next title bout. Once old enough, he wants to compete for a world title.